When you access HTML pages from the Safari® browser of the iPad® or iPhone®, the functionality of certain elements is restricted or altered. The following is a list of the known issues and considerations when using the iPad or iPhone. The display and functionality of double list controls is different. For more information, see Double List Controls. Use finger swipes on the iPad or iPhone to scroll with an HTML control that normally has scroll bars. For more information, see Scrolling. The functionality for slider controls is restricted. For more information, see Slider Controls. The functionality of chained controls is different. For more information, see Chained Controls. RIA pages and regular pages are supported on the iPad and iPhone. Columns in a double list control display the name of a selected value only if a single value is selected. If no values are selected, the column displays 0 Items and if more than one value is selected, the column displays n Items, where n is the number of values selected. It is important to note that the number of items displayed refers only to the number of values that are selected, not all of the values in the column. To see all of the values currently in a column and to select more values, tap on a column and a pop-up menu appears, as shown in the following image. Since columns do not display the names of all available values, you must tap on a column to select values. You can move values between columns in the same way, regardless of how the HTML page is accessed. 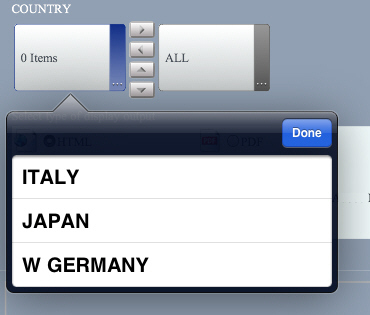 The following image shows the left column with no values selected and 0 Items displayed. A column with no values selected does not mean that the column contains no values. The following image shows the pop-up menu for the left column. All of the values shown are contained in the column, but none are currently selected. 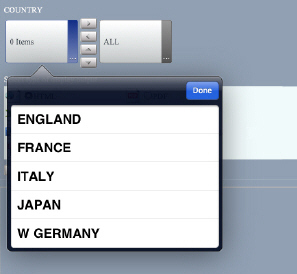 The following image shows the pop-up menu with England selected. The following image shows the left column with England selected. The column displays the name of the selected value since there is only one value selected. 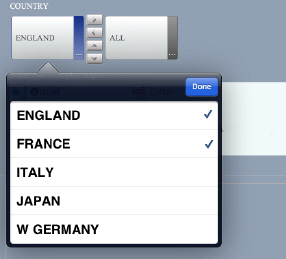 The following image shows the pop-up menu with England and France selected. The following image shows the left column with England and France selected. The column displays 2 Items since there is more than one value selected. You can press the right arrow to move the selected values from the left column to the right column. In this example, England and France move from the left column to the right column. The left column now contains only the remaining values, as shown in the following image. Elements that typically require scrolling do not utilize scroll bars on the iPad. A frame that contains a report automatically expands to fit the entire report, depending on the Sizing and Scrolling property setting of the frame. Slider functionality is limited when you access an HTML page on the iPad or iPhone. The slider bar on a slider cannot be used to slide the values up or down. To change the value, you must tap the end arrows to increase or decrease the selected number. The following image displays a slider control. Note: A double tap in the Safari browser causes a zoom in. The iPad and iPhone interprets tapping the end arrows too quickly as a double tap and zooms in. The functionality of a chain of controls is not automatically triggered when a multi-select control is included in the chain. You must tap Done from the pop-up box of the multi-select control for the next control in the chain to populate. In the following image, the Done button is highlighted by a red box.